Ever since Epica was created by Mark Jansen after his departure from After Forever the band kept reaching new heights. Within a very short period of time the band became synonymous to quality symphonic metal. Last year they celebrated their tenth anniversary with the special show “Retrospect”, which was released on DVD later on. Often such a momentous occasion and celebration signal a big change for bands. After a break Epica sat down together to write and record their newest album “The Quantum Enigma”. Is it still the Epica you know and love? Read on and find out! Opener “Originem” wastes no time to set up a dramatic intro with bombastic strings, horns and a choir section giving you the feeling of listening to the soundtrack of the best heroic tale out there. Expectations for the album are being raised to sky-high levels! Dive right into the first real track “The Second Stone” and after the power metal start you soon recognize the Epica you know, especially when Simone starts singing. Yet something is different, it’s hard to put my finger down on but it all sounds revitalized and exciting. Before hearing the album for the first time I was expecting to hear “just another album”. I enjoyed “Requiem for the Indifferent”, it was a good album, but it didn’t excite me. For some reason “The Quantum Enigma” grabs my attention right away and it’s my personal favourite after “Consign to Oblivion”. The songs themselves fit together better and they are a lot more accessible, while at the same time having so many details. You can read a bit more about that in the interview that I conducted with Isaac some time ago (Link: http://wp.livereviewer.com/2014/02/25/an-interview-with-isaac-delahaye-of-epica/ ). At first I thought that Mark and Simone had a lot less vocal lines than before, but after a few repeats I noticed that it was not the case. It’s just that there are a lot of choir parts on this album that often grab the focus. The choirs have helped to create a very bombastic feel for the album, yet the album never feels too overwhelming. It’s hard to pick any favourites because all the songs are top-notch and have several parts that just hit the right buttons, so I will just put a few forward so as not to spoil too much. “Victims of Contingency” starts off very heavy and the keyboards give it added bombast rather than subduing the song and I just love the contrast between Mark’s parts and the choir’s parts; the brutality versus the bombast. A lot of songs have a soundtrack-like feel for me, yet without it actually feeling like being a soundtrack is the main point of it. It’s still in support of the song. For example “Unchain Utopia”’s choir intro and following orchestral part made me feel like I was hearing a soundtrack for the fall of a city. Throughout the whole song the choirs carry a sense of loss and drama. Speaking of soundtrack-like songs, the instrumental “The Fifth Guardian – Interlude” could easily accompany a historical movie set in the east. One thing that really surprised me as it came out of nowhere is the awesome guitar and keyboard solo in “Reverence – Living in the Heart”. As usual Epica saved the highlight of the album for the end. “The Quantum Enigma – Kingdom of Heaven part II”, the title alone will set the hearts of fans racing, is a diverse and brilliant song. It’s nearly twelve minutes long, yet when the song ends I feel as if had only just started. A lot happens in here and you will recognize a lot of things of older songs in here, yet set in the new revitalized setting. You know what? I’m done spoiling this album, go out and get it! You won’t be disappointed! 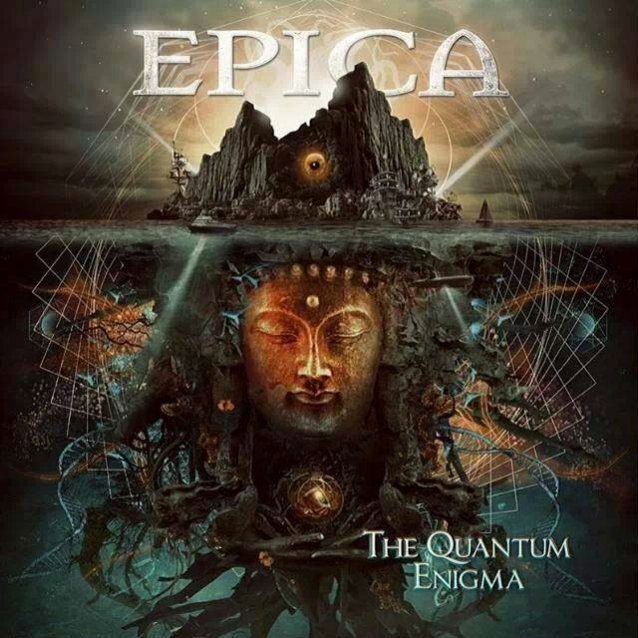 I was expecting another Epica album and in a way that it what I got. Yet in some strange way Epica have managed to revitalize themselves for the next decennium. It just feels fresh, new and exciting without, let’s be honest, really doing anything new. In some way it just oozes with the pleasure the band had in creating this masterpiece. It’s a cliché to say that a new album is the best one that a band has done, so I won’t. Instead I will say that Epica will have a bloody hard time trying to top this one. If you love symphonic metal you just can’t go wrong with this album. As an added tip: try to get the version with the acoustic bonus tracks.